The Evolution Powder Tester is an economical and easy-to-use powder flow tester that measures the unconfined yield strength (a critical flow property) of powders and granular materials. The unconfined yield strength can be measured at one pressure or at many different pressures in order to create a flow function. The flow function presents the material’s gain in strength after more pressure had been applied to it. 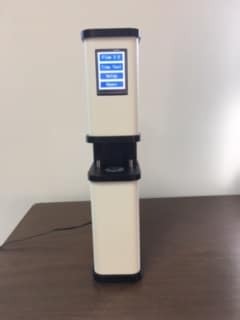 The patent pending EVOLUTION Powder Tester measures a powder or granular material’s response to environmental stresses. The major stress on a material is pressure. The EPT measures a material’s response to pressure by applying pressure to the material and then measuring its resulting strength. This strength is known as the unconfined yield strength. If a powder is to flow, the force making the powder move must be greater than the unconfined yield strength. The unconfined yield strength can be measured at one pressure or at many pressures to create what is called a flow function. The flow function presents the material’s gain in strength as more pressure is applied to it. For most powders and granular materials, the longer the material is exposed to pressure, the higher the unconfined yield strength becomes. Therefore, for powders and granular material that are stored for any length of time, it is essential to study the effects of pressure over time. This is called time unconfined yield strength. In addition, a time flow function can be created. With the EPT, time tests are easy and inexpensive to perform. Time cells consist of sample cells and weights that allow a material to be subjected to various pressures over long periods of time. In addition to pressure, temperature and humidity can affect a material’s strength over time. The EPT time cells are designed so that they can be easily placed in ovens and humidity chambers to study their effects on materials in storage situations. Time is the unmeasured parameter in flow property tests. The reason? Analysis cells for many flow measurement cells are very expensive and do not include the means of applying pressure over long periods.